Ronny Deila continues to keep faith in injury-jinxed James Forrest as the Hoops winger prepares to make his latest comeback. 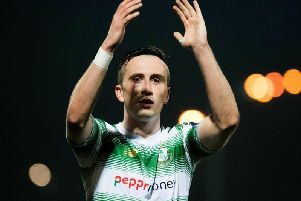 The 23-year-old former Parkhead youth player has suffered from various ailments since making his debut as substitute - and scoring - in a 4-0 win over Motherwell on May 1, 2010. Forrest’s undoubted talents have won him international recognition with Scotland but, since taking over from Neil Lennon in the summer, Deila has still to see the best of the player who has made 10 appearances in 10 months. A knock picked up in the recent 2-1 Scottish Premiership defeat by Dundee United at Tannadice meant he missed the goalless draw against Ross County on Saturday. However, Forrest will return to the squad for the trip to Partick Thistle on New Year’s Day, and the Celtic boss explained why he is nursing the player back to full fitness. Deila said: “He is a special boy that we need to take more care of, more than a lot of the others because he has been out for a long time. “He has been out for 550 days in the last four years, which is almost two years, so you need to take it slowly and build it up again. “Now he has been injury-free for two months. He got this little one (injury) but it is nothing serious. So this is going very well. “If you push him too hard then he is going to be out again. “He has progressed. Against Dundee United he was more active than he was before but you need consistency over time to get the best out of James. “The problem has been pulled muscles so we need to get his fitness up. “It is one thing is to run, another to play football. You get football fitness by getting on the pitch.